Prem Singh, the co-writer and actor who plays the lead role, with Pardeep Singh Nagra, on the sets of the film ‘Tiger’. 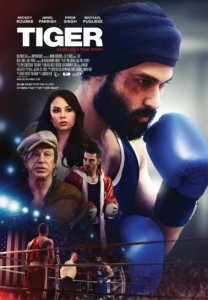 NEW YORK – The incredible story of talented Indo-Canadian boxer Pardeep Singh Nagra who was denied a possible berth in the 2000 Sydney Olympics after he was barred from fighting in the ring because of his beard, by the Canadian Amateur Boxing Association, is the focus of a new film ‘Tiger’, playing in select theaters in New York, Los Angeles, Toronto, and Vancouver. Poster of the film ‘Tiger’. 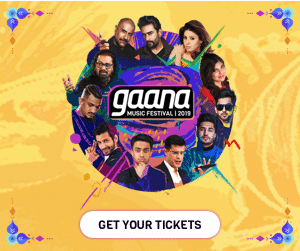 Tiger also stars Oscar-nominated actor Mickey Rourke, who plays Nagra’s coach, and ‘Pretty Little Liars’ star Janel Parrish plays Nagra’s love interest. Pugliese also doubles up as a boxer in the film. Nagra was a sensational boxer from Ontario, who seemed to be set for the big stage when he won the Ontario light-flyweight championship in 1999, and was reckoned to be with a chance at the Canadian nationals that year in British Columbia. That would have paved the way for him being selected in the national team for the 2000 Sydney Olympics. However, the Canadian Amateur Boxing Association (CABA) didn’t want men with beards to fight in the ring. For Singh, a practicing Sikh, keeping a beard was a matter of religion and faith. CABA disqualified Singh, saying that what applied in Ontario didn’t hold good in British Columbia. Nagra got a reprieve in court after his lawyers got him an injunction that would allow him to fight in the national championship. However, that hope vanished after CABA came up with a devious plan: they took the entire light-flyweight class out of the championship that year. Nagra’s Sydney dreams were crushed. Nagra didn’t stop there, though. He continued to fight legally for his rights. Some boxers around the world, including some Sikhs, evade the rule of not having a beard on court, by shaving on the eve of a bout, then growing a beard again. Nagra, however, was not ready to do that. Ultimately, the court ruled in favor of Nagra, and CABA had to change their rules. Today, men with a beard can fight in the ring in Canada. Nagra, after the court ruled in his favor, get a shot in the 2000 national championship of Canada, against two-time Olympian and 10-time national champ Domenic Filane Figliomeni. Prem Singh, the co-writer and actor who plays the lead role of Pardeep Singh Nagra, from a still of the film ‘Tiger’. 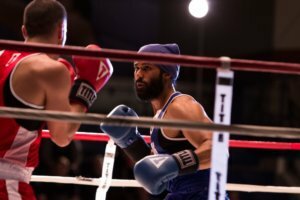 The film ‘Tiger’ delves into that thrilling bout between Nagra and Figliomeni. Nagra, who today is an activist, and has traveled extensively speaking about Sikh religion and Sikh rights, is executive director of the Sikh Heritage Museum of Canada, manager of the employment equity office of the Toronto District School Board, and serves on the board of directors with the Canadian Museum for Human Rights. In an interview to News India Times, Nagra said that “no gold medal is worth the sacrifice of my beard and faith”, when asked if he was still bitter over not getting a chance to box at the 2000 Sydney Olympics. 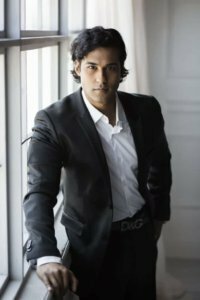 How does it feel for a film on your valiant story, ‘Tiger’, to be out here in the United States at a time when intolerance has heightened for minorities? When we look at both the political and social climate in the United States and around the world, it is very timely that Tiger is being released. In fact, the issue it speaks to, beards in boxing itself is still a relevant topic as England just recently changed their rules and IABA, the International Amateur Boxing Association, is currently reviewing the rule some 20 years after my successful challenge of the beard rule in amateur boxing in Canada. Do you still feel bitter that you perhaps lost an opportunity to box in the 2000 Sydney Olympics because of religious discrimination? I don’t feel bitter, but rather disappointed, that while other fellow athletes just got to focus on their boxing and training, my first fight and many more were outside of the ring in the courts. But I have always said, no gold medal is worth the sacrifice of my beard and faith. I know there will be a Sikh champion, so it was not about my opportunity as a single person but creating opportunities for others. You are a trailblazer for the Sikh community in Canada. And an inspiration for Sikhs worldwide. Do Sikhs in general still get discriminated in Canada, especially in schools, where bullying begins at an early age? Sikhs have and will continue to be discriminated wherever they plant their roots as a family or community. Whether it is in the homeland of Punjab, the five star state in the US, Montreal in Quebec, Canada, or anywhere else, discrimination and racism is a fact of life of being a Sikh as unfortunate as that sounds. I have been doing everything in my power as various levels to try to mitigate the impact of discrimination against Sikhs in public, at work and in schools. 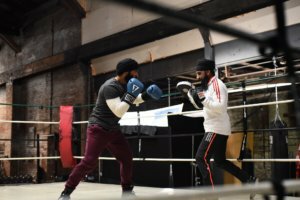 Prem Singh, the co-writer and actor who plays the lead role, sparring with Pardeep Singh Nagra, on the sets of the film ‘Tiger’. Several Sikh community organizations in the US work hard to make the mainstream masses understand the Sikh faith, and be more tolerant towards it. What is your message to these groups? What should they do to minimize racial discrimination in society? The Sikh community organizations have yet to tell and share the American Sikh story of pioneers, settlers, service, and nation builders. It is incumbent that they are fully versed in the history of Sikhs in America and engage at all levels to share this history. We are more than a theological faith; we are a people who have been contributing and engaging America for over 125 years, this is what needs to be in the textbooks etc. and the message of who we are, and less about what are our actual spiritual practices. In the US, it seems there is almost a perpetual fight for Sikhs to adhere to their religious beliefs in the police and armed forces, where keeping a beard is frowned upon. Often, there are long legal fights for this freedom to be achieved. Is this the same in Canada? Sikhs have fought these battles in every country they have settled, including England, Canada and now in the US. Ironically, historically, Sikhs have fought in both world wars with nothing more than their turbans on, and have served in police forces around the world with turbans including the UN. It is beyond ludicrous that these legal battles need even to take place. Simply put, it is pathetic to think that someone has to take legal action to serve one’s country or community. Your fight for human rights in Canada is resonating around the world. 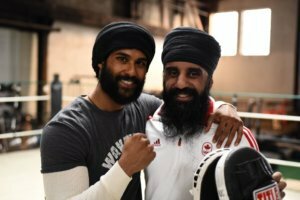 The Amateur Boxing Association of England lifted the ban on beards in boxing rings back in June, after years of campaigning from Sikh and Muslim groups. How often do you travel to other countries to talk about this religious discrimination and get the ban reversed globally? You are co-founder and executive director of the Sikh Heritage Museum of Canada in Mississauga. What do you wish to achieve with this museum? Simply put we have already achieved it. As the Prime Minister of Canada wrote on his visit…the story of the Sikh community, is in fact, just the story of Canada. We are sharing the history of Canada through the Sikh lens. By when do you expect a Sikh Prime Minister in Canada?